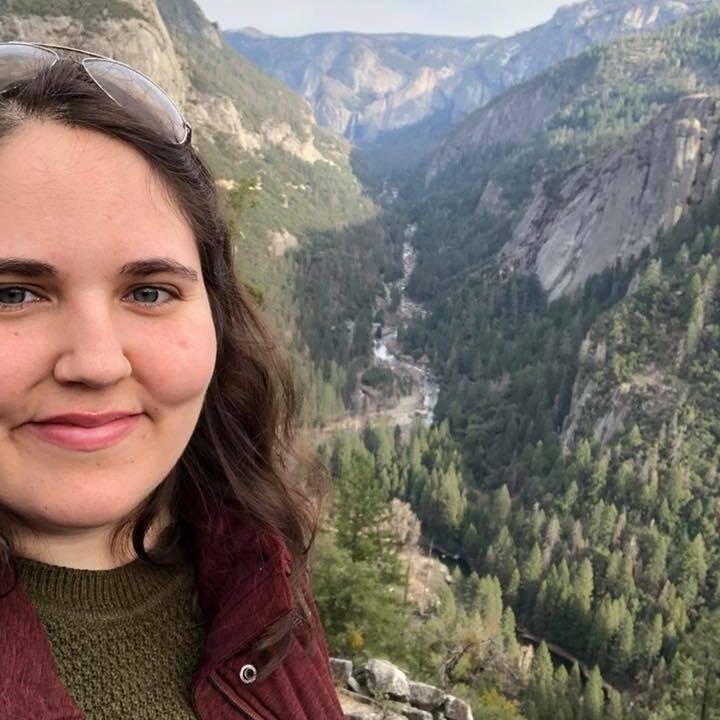 I had recently gone out to a restaurant with some coworkers and we decided to order all of the tapas style appetizers instead of limiting ourselves to individual entrees. One of the appetizers we ordered were shishito peppers and they were so fun to eat with a group because one in ten peppers is incredibly spicy. It was like a game of roulette with food. Of course a few weeks after when I saw shishito peppers at the grocery store I had to get them so that I could make my own. 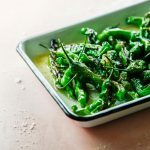 These Blistered Brown Butter Shishito Peppers are ready in about 10 minutes, which makes them a great option for an easy appetizer. 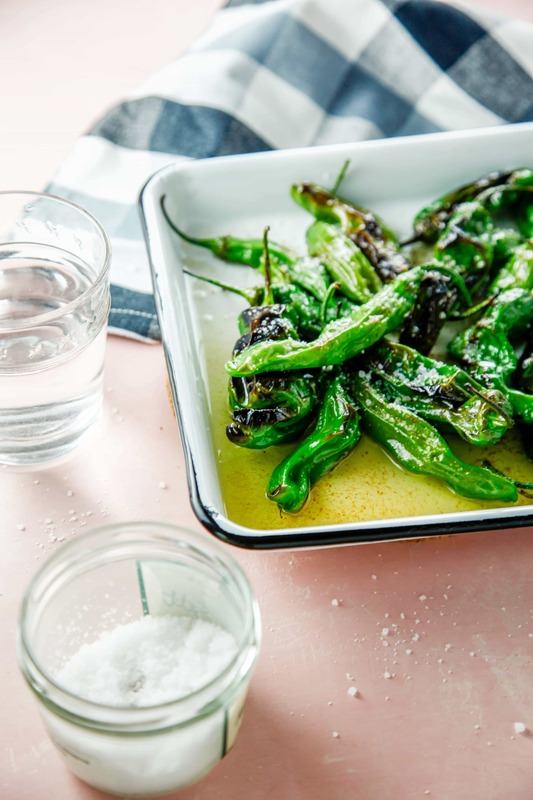 These are tossed in brown butter, a bit of lemon juice and plenty of sea salt and while there are some spicy peppers, they aren’t as spicy as jalapenos or other common hot peppers. But to be safe, maybe have some milk and bread on hand to cut down on the spice. Peppers are easy to blister and can be done on a gas stove top for large varieties or in the oven. I have an electric oven so I can only use the oven method. To cook the peppers, I put the broiler on high then put the peppers onto the top rack in the oven for 3-5 minutes. This will cause them to blister and cook through enough to soften but maintain their shape. Seasoning them consists on tossing in brown butter, lemon juice and sprinkling salt on top. My favorite salt to use is a Maine sea salt. Sea salt will have the right size and consistency in the crystals as well as having a milder flavor than iodized table salt so that it won’t overpower the peppers. I go through several tubs of this salt a year and have to get it whenever I go back home to visit. For all of my other cooking I use unrefined sea salt in my cooking as a healthier alternative to regular table salt. It’s a small change but an easy one to implement as well. 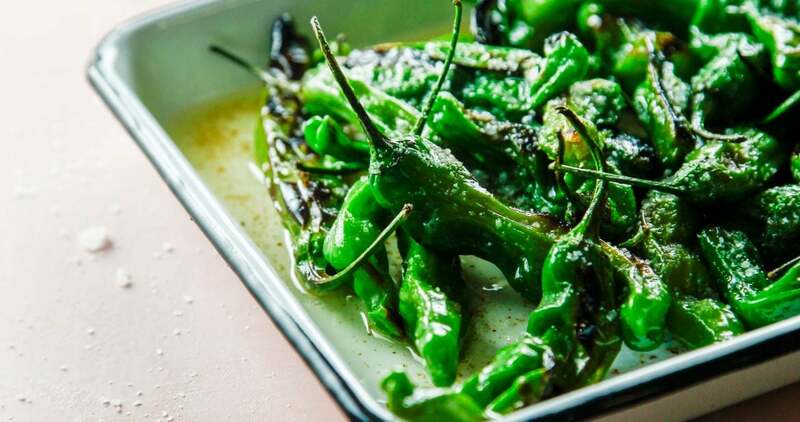 Have you tried Shishito Peppers yet? If so let me know how you like to eat them! Need a new kind of healthy appetizer? 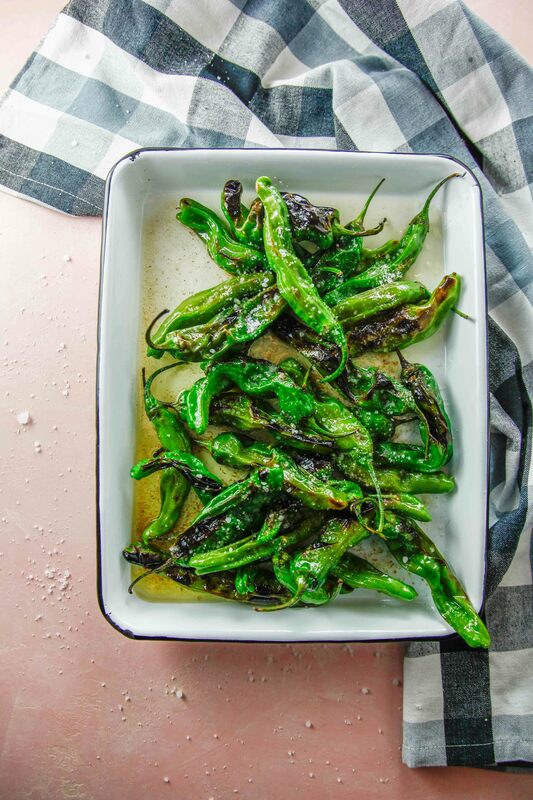 These Blistered Brown Butter Shishito Peppers are ready in 10 minutes and couldn't be better! Turn the broiler on high. 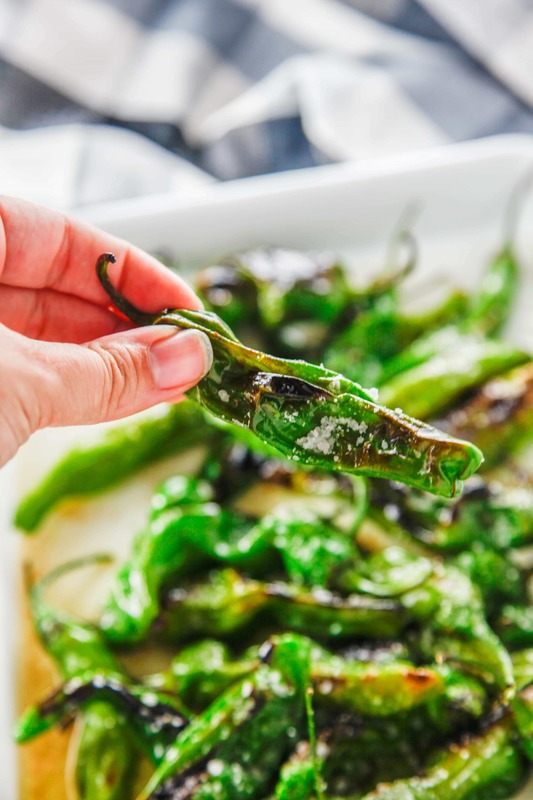 Spread peppers onto a baking sheet in an even layer. Put under broiler for 3-5 minutes or until blistered and softened. Melt butter in a skillet over medium-high heat. Continue cooking butter until milk solids separate and begin to brown. Remove from heat and scrape up all of the browned bits. Coat peppers in browned butter, lemon juice and sea salt. Enjoy! 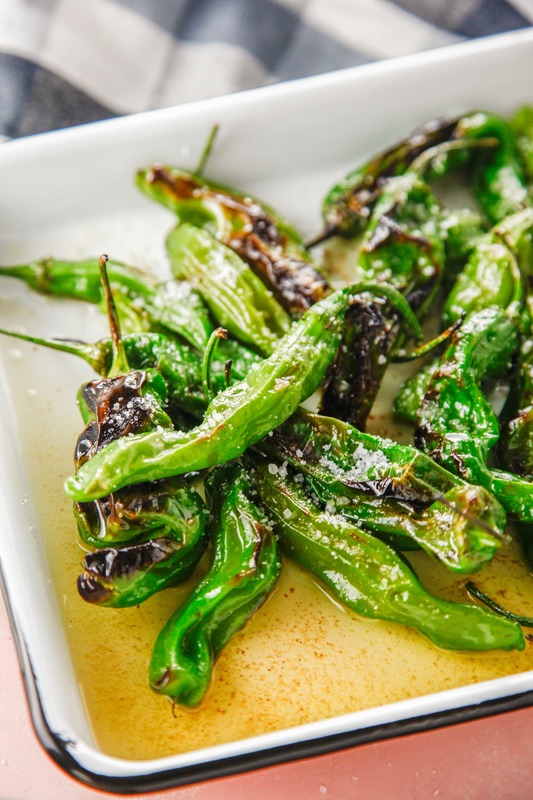 These peppers are perfect for appetizer. I really like it. So, so goood! Very well! Looks tasty! Simple but oh so delicious. I can sit behind a tray of these. They look amazing!! I love cooking shishito peppers. In fact, I’m the only one that eats these. Love the sound of brown butter flavor. Next time I’m going to try these. Sound yum. Oh wow, oh wow! This is best thing i’ve seen today. Though i haven’t tried shishito peppers, sad we dont get it in my part of the world! BUT I love all things spicy. I’m thinking i’ll add these to my soup or salad, chopped – do you think it’ll work? We use a lot of peppers but we’ve never roasted or blistered Shishito peppers. I bet they would be terrific in any recipe where you want some heat or as you mention as an appetizer. YUM!! We’ll have to try some ASAP. This looks amazing!! I haven’t had anything made with browned butter for a long time. I love the sound of this! 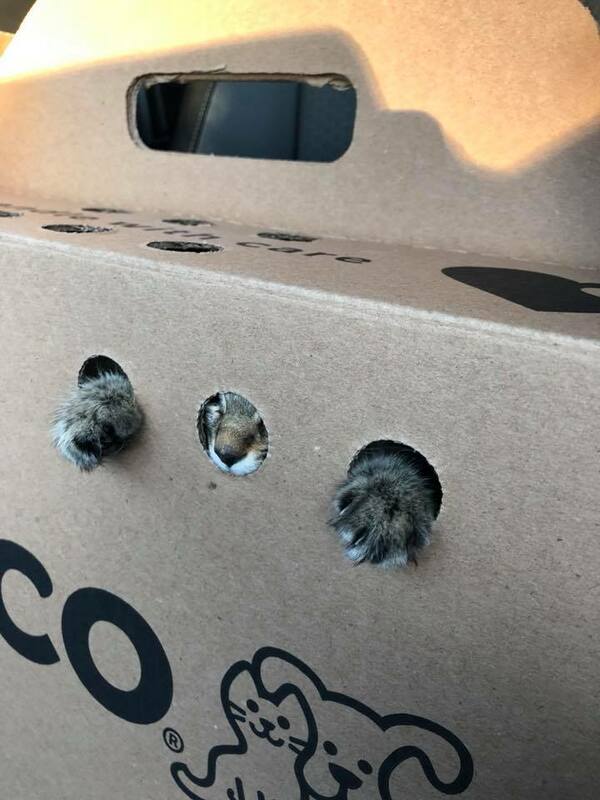 I have yet to meet a cat that likes traveling to the vet, mine have always hated it. My oldest loves foods with heat so I’m sure he’d be up for trying these peppers.